As we get older, the production of collagen and elastin – two types of fibrous protein that give our skin a youthful and firm structure – begins to decrease. We start to lose volume and definition in specific areas of the face, and fine lines and wrinkles can become more noticeable. Here at Younger U Aesthetics, we specialise in non-surgical aesthetic treatments that provide effective anti-ageing results, carried out by a skilled and experienced professional in a safe environment. 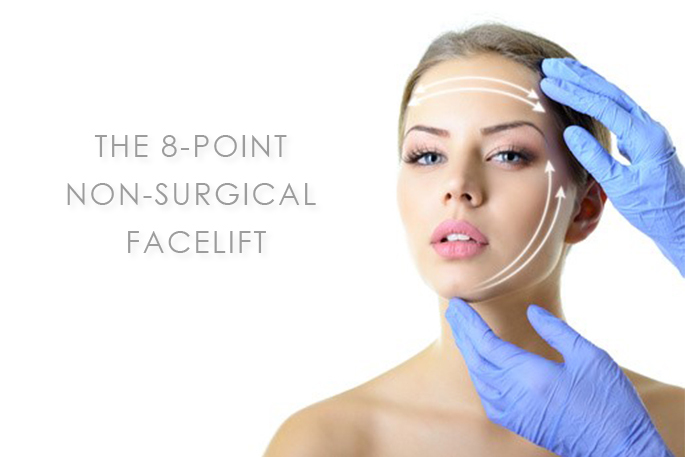 One treatment that we are proud to offer is the 8-point Face Lift – also known as a non-surgical or ‘liquid’ facelift – which involves the administration of Dermal Fillers to lift and enhance the contours of the face without invasive surgery. The 8-Point Lift can help to restore youthful definition to the jawline and jowls, and around the cheeks and mouth. It is a popular treatment given that the results are instant and can last for up to 18 months (depending on the product used and the area treated). As with all injectable non-surgical treatments, if you are considering a Dermal Filler treatment – whether for lip enhancement or to restore volume and definition to the face – it is important that you make sure you visit a medically qualified professional. Injectable cosmetic treatments need to be carried out precisely and expertly to ensure that the results are subtle and sensitive and to reduce the potential for side effects occuring. If you are looking for an accredited and qualified medical professional to carry out a Dermal Filler treatment in your area, I would strongly recommend that you visit www.saveface.co.uk – a Professional Standards Authority accredited register of Aesthetic Practitioners in the UK. They’ve also got a lot of useful impartial information about non-surgical aesthetic treatments on their website too, so should be considered the place to go if you are looking for skincare advice.